Temple Brewing have produced the beer that I'm drinking this evening. Basically I was torn between having a proper winter beer, considering winter is almost up, and having a big American IPA. The Midnight IPA seemed like the perfect compromise. An American Black Ale is also commonly known as a Black IPA, or BIPA for short. In layman's terms the style is basically a mix between stout (or more accurately porter) and an IPA. If done well it can be close to the perfect winter beer for hopheads, like myself. I've never had this beer so can't wait to try it! The body of this beer is absolutely jet black! It's totally opaque and has quite a viscous head on top. The head is a cream colour and there seems to be plenty of carbonation to sustain the head. This hypothesis was confirmed when half way through drinking about 80% of the head was still there! The retention was spectacular and the lacing of the glass was excellent. A+ for appearance for this beer! 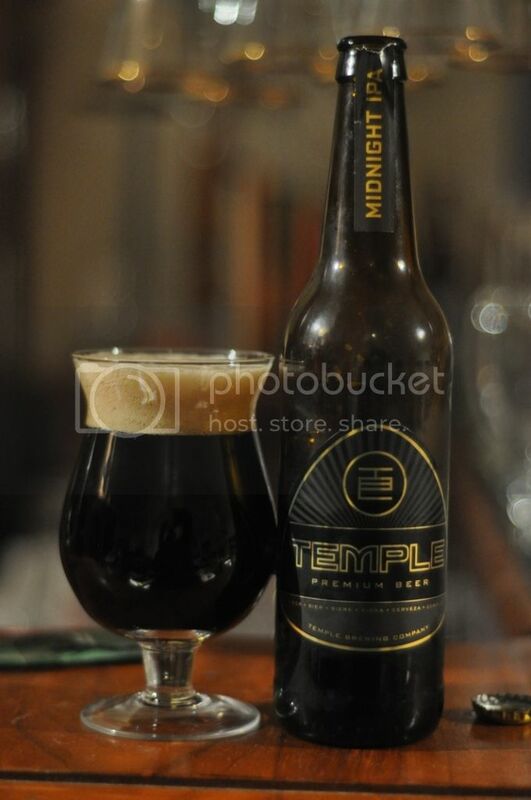 On the nose Temple Brewing's Midnight IPA smells of everything you would expect an IPA to. There are huge citrus and pine hop notes up front before settling in with some darker malts which don't seem out of place. The overall aroma is somewhat confusing, with the beer struggling to decide if it's a stout or an IPA, but it does come together very nicely somehow. It's a very unusual nose but a very good one none-the-less. Amazing! Is one of few words that does justice to this beer in my opinion. The flavour is nice and complex, a really intriguing mix between the elements I love in an IPA and the elements I love in a stout. The most prominent flavours are an initial dark matliness, which is subdued but an onslaught of citrus (mostly grapefruit) and pine hops. It's really interesting flavour that needs to be tried to really understand exactly what is going on here. My overall feel on this beer was that it was more 'stouty' than anything else. Basically for me it was a hoppy stout. This is not to say that this wasn't a delicious beer, it really was, but to me it was somewhat confused stylistically. Would I recommend this beer? Absolutely! Would I buy it again? Absolutely! Despite what I said about it being a confused beer, it is absolutely delicious! You should go out and get this beer, it's worth every cent!